She stood up to face us with a seemingly forceful, yet sincere smile. Prepared to answer our questions about North Korea, she turned to the translator and nodded. The quiet confined country of North Korea (aka. Democratic Peoples Republic of Korea (DPRK)) has not been so quiet lately, with constant threats coming from the current leader Kim Jung Un. However, when it comes to knowing what goes on in the country day-to-day is more like looking through a keyhole; with Kim Jung Un holding a picture up in the way. But occasionally a defector from North Korea speaks up and lets us know what is really going on. I got to meet one such lady after visiting and stepping over the North Korean border within the DMZ (De-Militarized Zone). You can read more about my trip in my article The Most Dangerous Border Crossing On Earth? Being born and raised in North Korea is sheer bad luck, and getting stuck is nightmarish. Trying to escape, however, the risk couldn’t be higher. What happens if you’re caught escaping? Well, it’s horrible enough that the defector we interviewed took 2 poison capsules with her as she attempted her escape with her daughter. And as she put it, “Suicide is better than being caught”. Random Fact: The incumbent president of North Korea is Kim Il-Sung, even though he’s been dead for over 23 years. He assumed the office of the Eternal Presidency on July 8, 1994, and continues to hold onto power. North Korea is the world’s only necrocracy: a government that still operates under the rules of a former, dead leader. 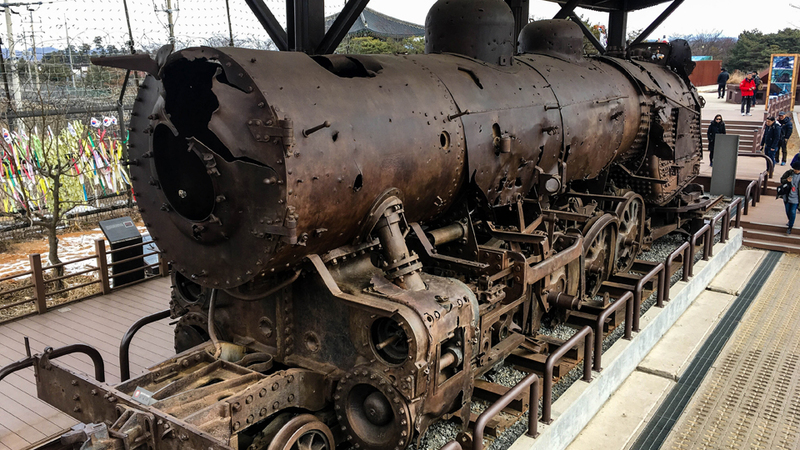 We had just got done visiting Imjingak Village, which is where the destroyed train still sits on the tracks full of bullet holes from the Korean war which I had mentioned in my previous post. Imjingak Village is only 3.27 miles (5.27 km) from the North Korean border. I’ve since learned a bit more about the train pictured above. It was shot at as UN forces were in fear that it would fall into North Korean hands as such had happened earlier. She stood up and smiled as she prepared herself for our questions and our translator stood near. The first question was asking if the people of North Korea believe all the propaganda; “many are brainwashed, some people believe in it, but most don’t because they know better now through news”. The next question was, of course, how do they get that news? “From CD’s smuggled over and radio that is from China, along with videos on USB (drives)”. Internet in North Korea is a closed circuit system, which makes it more of MAN (Metropolitan Area Network) which is controlled by the government. “What are your feelings on returning so close to North Korea”? This was asked because this interview began as we were leaving Imjingak Village as she was not with us during the border visit for obvious reasons. Her response was a simple “Sad, very sad”. The only thing she said when asked what she missed the most was “my son”. She continued to smile through the questions as she seemed very eager to let people know the horrors of her former home country, however, her smile didn’t fully last through that question. Random Fact: Human feces is used as fertilizer in North Korea, due to the severe lack of other resources. The supply shortage is so extreme that the citizens are forced to provide it themselves. The next few questions served to lift her spirits a bit though; “What has been the best thing about moving to South Korea?”. “Freedom, and I can eat as much rise as I want”! Of course, moving from the DPRK to any country, however, may not only cause culture shock (in the best way possible), but also some difficult things. Which lead to the question; “What has been the most difficult thing about moving to South Korea”? She thought for a moment and replied, “All the English that is used in South Korea, that I don’t know”. While we were getting closer to Seoul, the questions continued; as far as entertainment goes “all movies and shows are related to the greatness of their leader”. Another person asked, “When the son took over as the leader, what was the confidence of the people”? Sadly, “when he took over, everyone expected a better country, yet they have come to learn that he’s the worst yet”. Something pointed out to us was at a certain point, you can turn into a radio station to hear broadcasts from North Korea. Though, unfortunately, we weren’t able to partake in doing this. Random Fact: North Korea follows a “three generations of punishment” rule, meaning that if one person violated the law or is sent to prison, their children, parents, and grandparents are sent to work with them. My recording device was unable to capture the next question, but it was related to healthcare in the country; “hospitals don’t have enough electricity to run most of the time, no medicine is made in North Korea, so they must visit underground sellers and then return to the hospital when able and have a doctor administer it”. Another fact that came up, was that most defectors to escape to South Korea won’t even know how to write there name upon arriving. Most citizens are not educated since teachers aren’t paid unless by the parents directly; whom also must supply everything required for education. “Did her friends know she was planning to leave”? “No, if anyone knew she was planning on taking off, she would’ve been killed”; which is the sad reality as the government has spies everywhere to make sure everyone stays a loyal citizen. Most defectors will take poison, razor blades, and other such items along with them. If a defector believes they’re about to be caught, they’ll commit suicide to protect their family. If successfully caught the “three generations of punishment” will be used and most of the people related to that person will be executed, this is the price for wanting to leave the country. After this experience, it has really opened my eyes even more to the harsh realities of this world. We returned to the hotel and some of us who became friends during the experience parted ways. Everything I saw and heard had left me in a shocked state for the rest of the day. Now, North Korea is more unstable than ever, both the people and government; as nuclear missile tests become more frequent and the knowledge about the real world is spread around to the people. Please check back soon for a new article on more of my traveling experiences! You can also subscribe to my Youtube channel for weekly vlogs! ← Previous Previous post: Why You Shouldn’t Visit Japan During The “Golden Week”.